Esther grew up near Danzig, where residents were bitterly split between German and Polish national identities. As she tells it, "They were always fighting each other, but they blamed the Jews for the civil unrest." 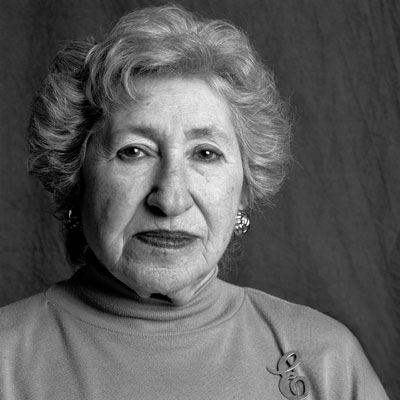 In 1939, following the Nazi invasion, Esther and her family fled east. At the Soviet border, small boats carried refugees across the river. Esther's family boarded, but her mother was pulled back. Esther continues, "My father begged to switch with her. He kept shouting to let him get off and let her go instead, but the boat pulled out leaving her behind." In Ukraine, they were robbed and had to go door to door begging for shelter. "Then," Esther recalls, "out of nowhere, my mother found us. Her legs were swollen from walking for miles in sub-zero temperatures." They lived in a barn for two weeks before the Russian Army found them and dispatched them to Siberia. Esther's father suddenly fell ill and died. Her pregnant mother gave birth to a boy who died of starvation before his first birthday. In 1942 Polish civilian prisoners of war were granted permission to move freely within the Soviet Union. Esther and her sister sold stolen potatoes for train fare and took their mother to central Asia, where they found farm and factory work. At war's end, they returned to Poland, found no living family members, then left to create new lives in the West. Esther volunteered in 1948 to go to Israel. She remained there six years, two years of which were spent in the Israel army fighting Arabs. Esther's parents came to the United States in 1949. Ester came to visit them in 1954 on a visitor's passport. She had not seen them in six years. After the period was over she asked for and received a six-months extension to her passport. While on a visit to Mobile, Alabama, she met Sam Loeb, whose father was an immigrant from Romania. Sam lived in Plateau, north of Mobile. Esther and Sam were married, and they lived in Mobile until 1960, when they moved to Nashville, Tennessee. Writing about Esther's time in Nashville, the Tennessee Holocaust Commission said: "Esther Loeb survived the Holocaust and lived life to its fullest by surrounding herself with family and friends. She was committed to educating others about the Holocaust and worked tirelessly in that cause. At this year's Middle Tennessee Holocaust Education Conference she served on the panel of speakers and encouraged students to do everything they could to combat prejudice and hatred so that a Holocaust could never happen again. Esther gave freely of her time and spoke to many Tennesseans about her experiences during the Holocaust. She will be missed by everyone who knew her, but her memories and reflections will live on to inspire and comfort others for years to come."